Arawale National Reserve is located in Garissa County in the North Eastern province, 5 km from the left bank of the Tana river. Arawale was gazetted in 1973 covering an extension of 533 km² and with the primary purpose of protecting an extremely rare antelope species which is found only in this region, the hirola or Hunter's hartebeest. The landscape in this area is mostly a dry thornbush savannah. Visiting Arawale requires a 4WD, since there are no tracks within or leading to the reserve. Arawale can be reached either from Nairobi or from the coast. Departing from Nairobi northward along the A2, turn right at Thika to the A3. This road leads to Garissa, but before reaching this town you will take a right turn to the B8 southward, heading for Malindi and Mombasa. After driving for 90 km you will find a detour left to the town of Bura, where you will arrive after crossing the Tana river. In Bura there is a crossroads where you will turn right. This road is the D568, which borders the eastern limit of Arawale before leading to Ijara and the coast. In Ijara you will find the Ishaqbini Hirola Conservancy, a community-run reserve supported by Italian NGO Terra Nuova. Ishaqbini borders the Tana River Primate Reserve and is a sanctuary for the dwindling hirola population. Arawale is located 250 km north of Mombasa and 130 km north of Malindi. From each of these towns you will drive north along the B8 road, which runs parallel to the coast until turning inland upstream the Tana River. Leaving behind the town of Garsen and the Tana river primate national reserve, turn right to the track that leads to Masalani and Ijara. After crossing the Tana you will find a detour left that goes northward. This route traverses the reserve before reaching the town of Masabubu. Another option is going on from Masalani to Ijara, where you will take the D568 to the left toward Masabubu and Bura. Before reaching Masabubu, the track runs close to the eastern border of Arawale. 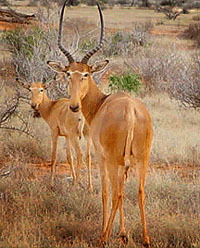 The reserve's main asset is the hirola or Hunter's hartebeest ('Beatragus hunteri'), a slender ungulate with lyre-shaped horns which is called the 'four-eyed antelope' for its visible preorbital glands. It can only be found in this region and is critically endangered (only the previous step to extinct in the wild) according to the IUCN red list of threatened species. Only 245 specimens were detected during an air survey conducted in 2010, although the actual population may be somewhat larger. Some hirolas have been translocated to Tsavo East National Park in an effort to save the species. Arawale is also a refuge for some species like elephant, giraffe, Grevy's zebra, African wild dog, cheetah, lesser kudu, buffalo, hippo and crocodile. There is no accommodation available at the reserve. The nearest hotels are in Garissa, northward, and Garsen, southward, but both towns are quite far away from Arawale. There are no campsites in the reserve, but if you wish you can apply for a camping permit. The nearby Ishaqbini Hirola Community Conservancy allows camping in the bush and along the shore of Lake Ishaqbini. In any case, if you are up for camping in this region, make sure to enquire about the safety situation, since the Somali border is not far away and the area may be raided by bandits or poachers.